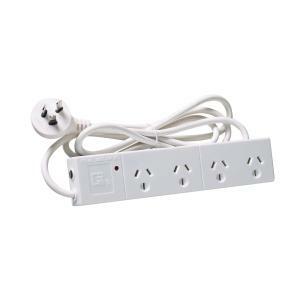 This Powerboard features 4 outlets with overload and over voltage protection which automatically cuts off when overloaded to protect your electrical appliances and electrical spikes and surges. A push button is used to reset the powerboard should it cut off, and a red light glows when voltage protection is operating. The light no longer glows when the voltage protection has absorbed surges. The powerboard has a slimline plug and keyholes at the back of the unit enabling it to be attached to a wall.